Susana loves spending time among fruits, vegetables and herbs. She does that in her plot at a community garden called Fuente de Vida. You make it possible for Susana and hundreds of other families to cultivate their own fresh food at one of the 68 community gardens in the Food Share network. As a youth, Susana wasn’t even aware of how produce grows since there was no garden space where she was raised. She also knows what it means to live on limited resources. Since that time, your generosity has given Susana the education and support she needs to grow enough food to share with her family and friends. Her green thumb began to develop a few years ago when she decided to plant tomatoes. They were a successful start so she began attending gardening workshops and eventually spotted a flyer for the Food Share’s Seed to Supper gardening course. 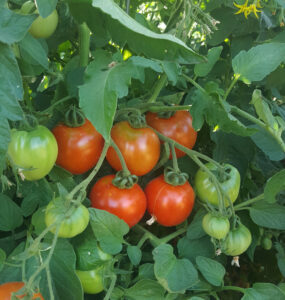 Tomatoes thrive in our garden network during the summer. “I thought, hey, I don’t know it all. I could learn something,” Susana said. She first took the class offered in English, then again in her native Spanish. Both teachers were so enthusiastic that they inspired Susana to consider yet more. “That’s when I thought. . . I would like to teach it one day,” Susana said. When she inquired about the process, the next step was to become a Master Gardener. Master Gardeners are taught to identify plants and pests; they also learn how to control pests and disease which is especially important for these organic, edible gardens. Inspired, she wanted to pass on her knowledge, especially to fellow Latino families. Susana led a class last spring. Because of you, the Seed to Supper course is offered in a variety of local communities for free with priority given to low-income families. Your support also allows those who complete Seed to Supper to receive many additional free benefits: seeds, starts and a community garden plot. A single 12 foot by 12 foot plot provides enough to feed up to a family size of 4, according to Lexi Stickel, Community Food Systems Manager at the Food Share. Although gardens are usually planted in the spring and thrive throughout the summer, Susana explained that the need for food is often greatest in the winter, especially if gardeners have seasonal jobs in agriculture. She has taken her appetite for learning and given her fellow gardeners the tools and learning environment necessary to be successful during any season. You make it possible for six Seed to Supper courses to be offered once again this spring. Because of you, another group of participants will learn together how to grow nutritious, fresh food for their household.